Bridge Is Part Of The Lorell 97000 Modular Desk Series With Commercial-Quality Performance And Components. Durable Steel Chassis Supports A 1-1/8" Thick, Laminated Top With Two Integrated Grommets For Wire Management. Laminate Is Stain-Resistant And Scratch-Resistant For Durability. 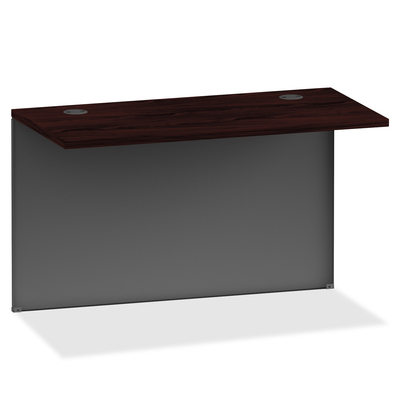 This 42" Wide Bridge Can Be Combined With Single-Pedestal Desk Or Single-Pedestal Credenza To Create A U-Station. Mount On The Side With No Pedestal To Avoid Interference. Built-In Cord Management Provides Easy Access To Power And Data While Minimizing Clutter. Rich Mahogany Laminate And Charcoal Paint Create An Upscale Look And Feel For Any Application..